A bursa is a small sac of fluid whose function is to lubricate the movement between tendons and bone. There are a number of them around the knee which can become painful and inflamed. The more common are prepatella bursitis, also known as housemaids knee, and infrapatella bursitis. Housemaid’s Knee also known as prepatellar bursitis or knee bursitis is a swelling of the bursa or small sack of fluid at the front of the knee. It can be acute or sudden onset or chronic where it occurs gradually over time. Here we explain injury in more detail the treatment options available. Symptoms of Housemaid’s knee include pain and tenderness at the front of the kneecap and just below it. The kneecap or patella may be swollen and warm to the touch. Kneeling may be painful, hence the term housemaids knee. An abscess or lump may be visible over the patella. If the injury becomes chronic then there may be a tender lump floating underneath the skin on the kneecap. 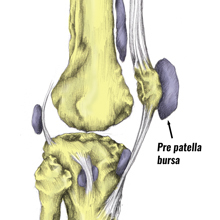 Acute prepatellar bursitis can be caused by a direct blow or fall on the knee. This ruptures blood vessels which bleed into the bursa causing swelling and triggering an inflammation reaction in the walls of the bursa. Subsequently, the walls may then thicken, causing tenderness that may remain even after the swelling has reduced. Acute knee bursitis can also be triggered by an infection as a result of a surface injury, such as a skin wound over the kneecap. In this case, bacteria may spread into the fluid within the pre-patellar bursa causing infection. Chronic bursitis is a longer-term problem which may recur over a period of time. Repeated damage to the knee for example from kneeling or work that involves a lot of pressure on the kneecap thickens the walls of the bursa causing irritation. Acute prepatella bursitis should be treated as soon as possible with rest and application of ice or cold therapy. Ice can be applied for 10 minutes every couple of hours for the first 24 to 48 hours, especially if it is painful. Avoid kneeling down or applying any pressure to the knee. A doctor may prescribe NSAID’s or anti-inflammatory medication such as Ibuprofen. Always check with a doctor before taking medication. Chronic prepatellar bursitis: If acute bursitis does not respond to treatment or has been present for a number of days or weeks then as with an acute case avoid any aggravating movements such as kneeling. Wear knee pads or padded knee supports to protect the knee. If the swelling persists then a medical professional may aspirate some of the fluid within the bursa. This involves sucking the fluid out with a needle and syringe. In cases where the bursa has become infected then antibiotics may be prescribed. In more serious cases the bursa may be completely removed by surgical procedures. This particular knee injury occurs when the infrapatellar bursa below the kneecap becomes inflamed. Infrapatellar bursitis symptoms consist of pain at the front of the knee with swelling over the area of the infrapatellar bursa. Pain may be similar to that of jumper’s knee or patellar tendonitis with pain just below the kneecap. A bursa is a small sac of fluid whose function is to lubricate the movement between tendons and bone. Infrapatellar bursitis or clergyman’s knee as it may sometimes be known as is inflammation of the infrapatellar bursa. 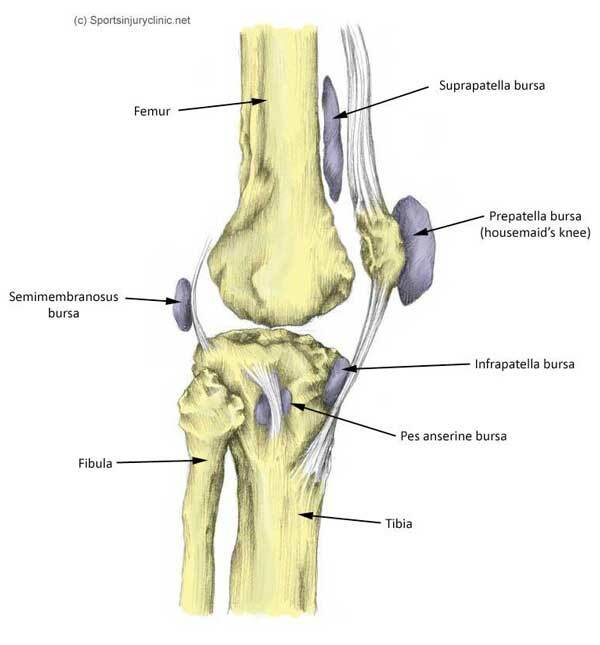 The deep bursa lies between the patellar ligament and the upper front surface of the tibia or shin bone. The superficial bursa is situated between the patellar ligament or patellar tendon and the skin. Infrapatellar bursitis can be caused by friction between the skin and the bursa and may sometimes happen in conjunction with Jumper’s knee. Rest is important to allow the bursa to settle down. This may mean modifying activities for a while or complete rest for a few days. Avoid putting direct pressure on the knee such as when kneeling as this is most likely to aggravate the symptoms. Applying cold therapy and compression will help to reduce the pain and swelling. A doctor may prescribe anti-inflammatory medication such as Ibuprofen but don’t take if you have asthma. If conservative treatment fails then aspiration can be done. This involves sucking out the fluid from the bursa and often an injection of corticosteroids into the bursa may be used as well. Surgery to remove the bursa may be undertaken as a last resort.